Talk about animal magnetism! 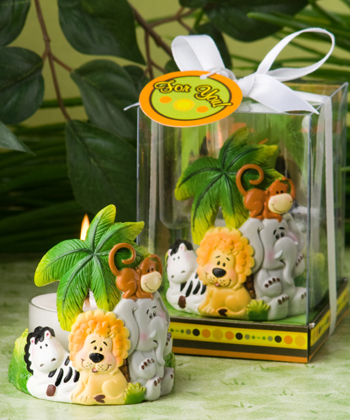 No one will be able to resist the cute-as-can-be characters cheerfully peering out from this jungle themed candle favor. Part of Fashioncraft’s exclusive Jungle Critters Collection of children’s favors, each measures 2 ½” x 1 ¾” and has a colorful hand painted poly resin base featuring young jungle animals including a resting zebra, a smiling lion, a shy elephant and a playful monkey atop the elephant’s head, all sitting together in the jungle grass below a palm tree. Nestled in the round base is a clear tea light holder with a white tea light candle included. A wildly popular choice as jungle themed favors or for any children’s event, each comes in a clear topped box with a jungle design base and background, tied with a white satin ribbon and an attached round matching design “For You” tag.